Those of us who have children understand that they hear far more than what we think they do. It seems like when we tell them to do something we need them to do, they’re completely tone deaf. But when we speak in a lower voice to another adult in another room about something we don’t want them to hear, lo and behold, they hear it from half a football field away. That’s why parenting is like always being in front of a camera, where everything you say and do is recorded for everyone to see and hear, especially our children. Nobody said being a parent was going to be easy. 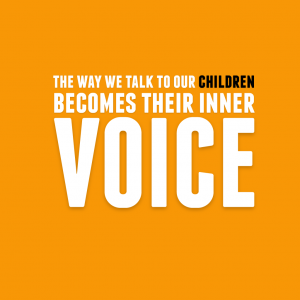 The way we talk to our kids has a huge impact on their learning and their ability to listen to us. We are constantly modeling to our kids how to behave and how to react to the world. Most importantly, the way we speak to them, and to those around us, show them how we want them to speak to us. They learn from seeing and hearing, but often from overhearing. If you mutter a curse at the car that cut you off on the highway, you can bet your child will hear that and you shouldn’t be surprised if you see her have the same response somewhere down the line. We are our children’s reality show: we are their favorite channel and they watch us daily, especially at those moments when we yell, are frustrated, tired and under the stressors that cause all of us to, at times, “lose it”. As we talk to our children, encouraging their questions and trying to thoughtfully answer them, they learn the power of words. We also reveal more of ourselves to them and we begin to understand each other better. That’s the best way to teach our children respect for our values and that begins with words. How are you talking to your children?